IBW: Benefits of Baby Wearing | For the Joy of Life. It's international baby wearing week! So, I figured I would share some insight on the best invention ever. When Oaklyn was still in the womb I had lists upon lists of things I thought I needed and must buy before she came. Despite maybe a few other things, my solly baby wrap is the best purchase I made! I wore this thing religiously when she was a tiny baby and I still continue to wear it often because it seriously saved my life time and time again as a new mom. Oaklyn was the baby that only wanted to be held, rocked, and moving at all times. Thank goodness I could wrap her on me during the moments I couldn't take it anymore and I just needed a break because my arms felt like they were going to fall off. I did tons and tons of research on baby wearing and finally came to a decision on which carrier to buy. 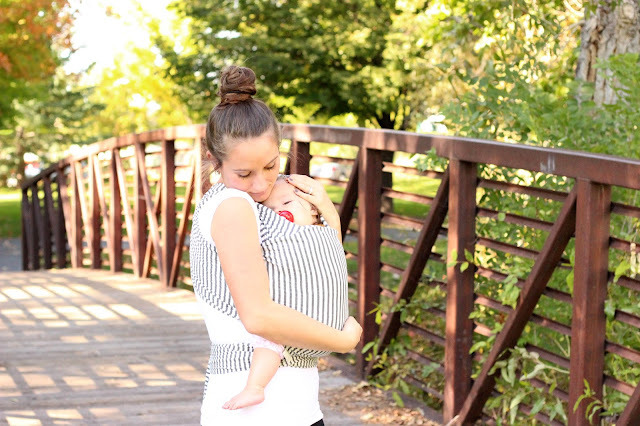 The solly baby wrap (in my humble but most accurate opinion) is the best wrap/carrier around. Fussy baby? Stick 'em in the wrap! Baby is super tired but fighting sleep? Stick 'em in the wrap! Need to get housework done but baby just wants to be held? Stick 'em in the wrap! It really fixes all your problems. Hunter and I used to go for 2 hour long walks when Oaks was a newborn because it was guaranteed that she would fall asleep in the wrap and stay asleep the whole walk. It was like we were on a little date where we finally got to just talk to each other without any interruption and I had a sweet sleeping baby snuggled up to my chest. Though the first time I attempted to wrap Oaklyn up when she was just a few days old was incredibly intimidating, I quickly fell in love and never looked back. So, with that little (long) preface... here are some of the best benefits of baby wearing! This is like unheard of as mother sometimes. Unless you get an angel baby. Then moms like me hate moms like you... I'm just kidding! That's awesome. One day, One day... I used to stick Oaklyn in my wrap while making dinner, cleaning, doing my makeup, shopping at the grocery store, the possibilities are endless! Other than her little fountain pony tail occasionally finding its way in my mouth... I forgot she was there at times! She always slept so soundly in her wrap. My little sweet pea loved sleeping on her daddy's chest when she was a few weeks old. She loved to be snuggled up on us and could snooze anywhere. That changed once she hit three weeks old and has never come back. She loves looking around and seeing everything out there. She has been so attentive and alert since day one. However, she can't resist the amazing feeling of snuggling up in the wrap. I love feeling her warm little body pressed against mine. Some of my absolute favorite moments of her life have been when she's snuggled up next to me in the wrap. I really don't mind pushing a stroller around. It's kind of relaxing and much less weight to carry around ;) However, there are just some places you cannot take a stroller. That's when I use my wrap! We have gone on hikes with it, walked on the beach, I've used it in several stores with small aisles, I've used it at church, Football games, Disneyland, the airport, walking around BYU's campus, and of course just around the house! Your baby is strapped on you and you are free to go wherever without having to worry about the bulky stroller running into things, or people! I am positive this is why Oaklyn loved it so much as a newborn. She was wrapped snug and tight on mama and could hear my heart beat just as she did in the womb. She would usually fuss when I would put her in the wrap but always stopped and calmed down instantly when I was all situated and she had her paci in. It took up to an hour at times to rock her to sleep, she instantly fell asleep in the wrap. Every. Single Time. Magic I swear. Those are just a few of the MANY benefits of wearing your baby. I know I'll be wearing baby number two (not that that's anywhere near happening anytime soon) often because I'll also have Oaklyn to chase around! 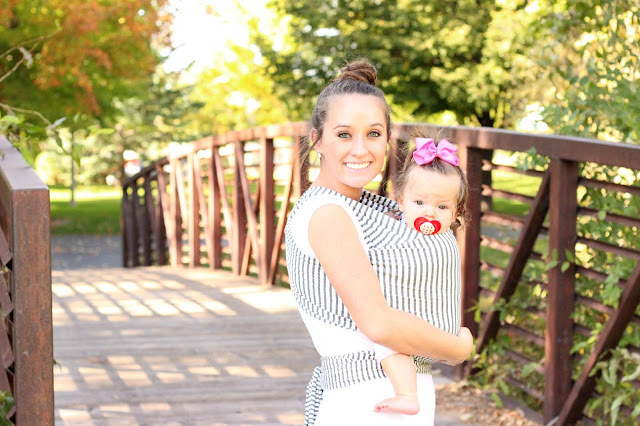 If you have more benefits or wrote a post on wearing your baby I would love to read it! Comment and leave a link below! Yeah for baby carriers!! I love how we both used different carriers but felt the same bond and ease with wearing our kiddos around! Cute! I still can't figure out how to get my little on into that type of wrap!